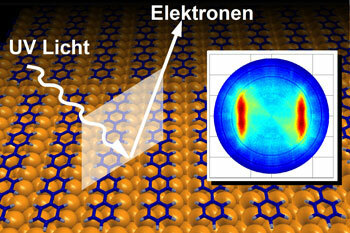 (Nanowerk News) For the first time, it has been possible to measure electron density in individual molecular states using what is known as the photoelectric effect. Now published in Science, this method represents a key building block in the development of organic semiconductor elements. Supported by the Austrian Science Fund FWF, the success of this project rested on the mathematical transformation of the measured data. This made it possible to interpret the distribution of the electrons and draw conclusions about the potential properties of organic semiconductor elements. A recent SCIENE paper sheds a new light on electron density in individual molecular states. Ultra-thin films made of organic molecules form the basis of future semiconductor technologies. Because organic molecules are extremely flexible, they can be used in a whole new range of applications, making it equally possible to create pliable screens and cost-effective solar cells. However, apart from these everyday applications for organic semiconductors, the most important task is to gain a betterunderstanding of the interactions between organic materials and inorganic carrier substances. A team from the Universities of Graz and Leoben has now succeeded in developing a means of doing just that. Original publication: Reconstruction of Molecular Orbital Densities from Photoemission Data, P. Puschnig, S. Berkebile, A. J. Fleming, G. Koller, K. Emtsev, T. Seyller, J. D. Riley, C. Ambrosch­Draxl, F. P. Netzer, M. G. Ramsey: Science 326, 702 (2009).